Iranian state broadcaster IRIB did not show a Bundesliga match between Bayern Munich and Augsburg on Friday because German referee Bibiana Steinhaus was officiating, German media reported, citing Iranian media. The broadcast was reportedly canceled because the country's strict Islamic regulations do not allow the showing of images of women wearing clothes that reveal large amounts of skin, such as football shorts. Natalie Amiri, Iran correspondent for German public broadcaster ARD, tweeted that the broadcast in Iran had been canceled "at the last minute," asking, "and who is responsible? Of course, it's Bibi again..."
In Iran, movie scenes showing women in what is deemed revealing clothing are censored. But this would have been impossible when broadcasting Friday's match, as Steinhaus was continually visible, reports said. However, a Bundesliga match in May last year, with Steinhaus as referee, was reportedly censored in this way, with random shots of spectators shown every time the cameras focused on her. She was named as one of Germany's top referees in 2018. Ms Steinhaus, are you a pioneer? 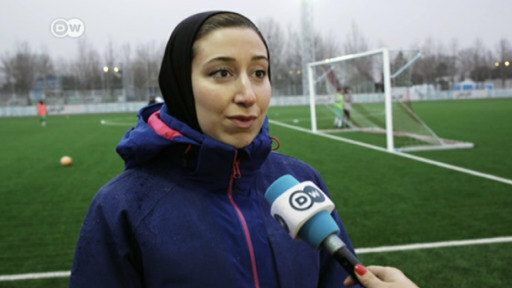 Since Iran's 'Islamic Revolution' women are banned from attending soccer matches, but they are allowed in the stadium as players. In fact, the women's U-19 team is one of the best in Asia. Its coach says her players are starting their own revolution.